SP-4 Benjamin Pena is a United States Army Veteran. Ben enlisted in the United States Army on June 30, 1955. Ben served 3 years as an engineer with Company A, 86th Engineering Battalion at Fort Dix, NJ. Ben spent 1 year deployed overseas. On June 27, 1958 having attained the rank of SP-4, Ben was discharged from Active Duty and transferred to the Army Reserve to complete his term of service. On June 29, 1963 Ben was Honorable Discharged. Ben was awarded the National Defense Service Medal, Good Conduct Medal. On behalf of Bugles Across America, please accept our sincere condolences. 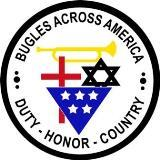 If it would be of comfort to have a live bugler sound Taps at this ceremony for your loved one, please feel free to either contact us directly or fill in the “Request a Bugler” form on our website at http://www.buglesacrossamerica.org. Please be aware that today almost all military and civilian honor guards play Taps using a recording device. We are a nationwide volunteer organization, we provide this service free of charge, and we do not require DD214 discharge papers to perform Taps for veterans. We also provide this service for law enforcement officers, fire fighters and other first responders.